The plumbing specialists at All-n-One Plumbing are happy to provide you with a variety of options when it comes to reliable sewer line repair and replacement services. Just call (816) 886-7600 today to schedule an appointment. Take a look at our online specials and deals on our coupons page. Why Are You Experiencing a Sewer Line Issue? Issues with your sewer line can occur due to a variety of reasons. In many cases, it requires a professional inspection to determine the exact cause. Here are a few common issues that affect sewer lines. Extreme weather damage. If you have recently experienced issues such as heavy rainfall, high winds, or extreme swings in temperature which have caused the ground to freeze and then thaw, weather could be to blame for the damage caused to your pipes. Tree roots. Unfortunately, the beautiful trees found in many yards can also cause problems with sewer lines because tree roots can often infiltrate, crush, or pull apart pipes during their search for water sources. Old pipes. In some cases, pipes are simply worn-out and break or begin leaking simply due to age. Homeowner damage. 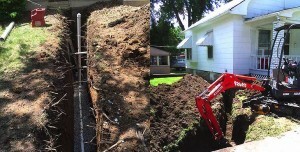 Did you rupture your sewer line while performing landscaping or renovations? It’s more common than you think, so don’t worry – just give us a call and we will get to the bottom of it. Serving your community since 2007: Our work comes backed by years of hands-on experience and knowledge. You can expect our technicians to work faster and more efficiently. Problem fixed right the first time: You can count on us to provide you with an accurate diagnosis and solution. We take pride in our work and are not content to do the minimum. Instead, you will receive high-quality work and unparalleled customer service from start to finish. Personal attention: Your comfort and safety always come first. Our talented technicians carry out work that meets all code and safety regulations. The job is not done until you are completely confident in the results. No pressure, no hassle: Your All-n-One Plumbing specialist is happy to provide you with a free quote. You are presented with an upfront price so there are never any surprises at the end. Give us a call at (816) 886-7600 for all of your plumbing needs in Independence, MO and the greater Kansas City area, including sewer line repair and replacement solutions. We will set up an appointment for one of our experts to visit and provide you with the solution you need.